This was 3 days after surgery. I could not figure out how to add to my current page or to add a picture of my knee so here I start again. I am starting to feel discouraged. My main concern is being ready to go back to work on the 1st of December. (I don't have enough sick days and I'll lose my insurance if I don't go back)I met with the physcial therapist today, and she said I was doing really well with the exercises, but did not add any more for me to do at home. I won't see them again until Monday and I feel like I could have done more there today. I have been doing these exercises for almost 5 days now. I am supposed to go back to work on December 1st so I wanted to schedule 3 visits next week, but they said that was too much. I don't understand- if I am doing the exercises at home anyway, I would rather do one set there so they can tell me if I am completing them correctly and give me feedback. They are very nice at this clinic, but I was seeing another PT before surgery that I loved, but I can't go to them because they are only allowed to take patients who have referrals from THEIR surgeons. That really stinks because they were good PTs. A patient shouldn't be punished for not using their "not so great" surgeons. I guess my knee is more swollen than it should be which made me sad. The PT said I was using the pillows wrong....the sheet the doctor gave me said NOT to place the pillows under my knee, only put them under my heel. That was very painful, but now I know I could have had the pillows "long-ways" and a lot higher. I am just trying to stay positive but I didn't think I was going to be in this much pain. This blog is the only thing that has keep me sane being able to read everyone's stories and get feedback. 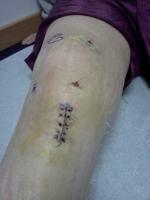 I am going to try to post a pic of my knee. It doesn't even look like my own leg. I have nicknamed it "Flubber Blubber."